Traffic light trails are an endless source of photographic inspiration. You can capture amazing colors and patterns, beyond what you can see and anticipate with just your eyes. 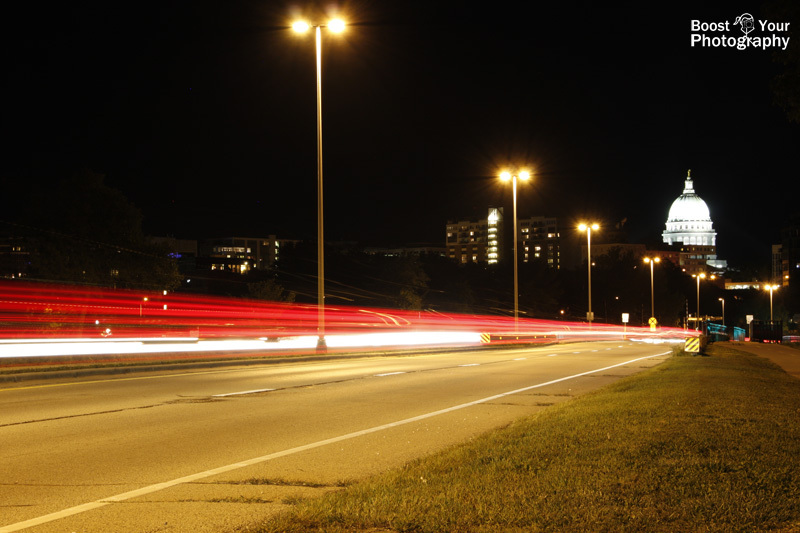 To capture traffic trails, you will need to use a long shutter speed. I recommend shooting in either shutter priority mode (S for Nikon or Tv for Canon) or manual mode, with an ISO of 100. In shutter priority mode, dial in a speed of 15" or 30" (" indicates seconds) to start, and the camera will choose an aperture. If you are shooting in manual, you will choose both the shutter and the aperture. If you are shooting in brighter or twilight conditions, you will likely need a narrow aperture like f/22. As the night gets darker, a wider aperture like f/8 or f/5.6 can also work well. You may need some test shots to find a combination that works best for your lighting conditions. 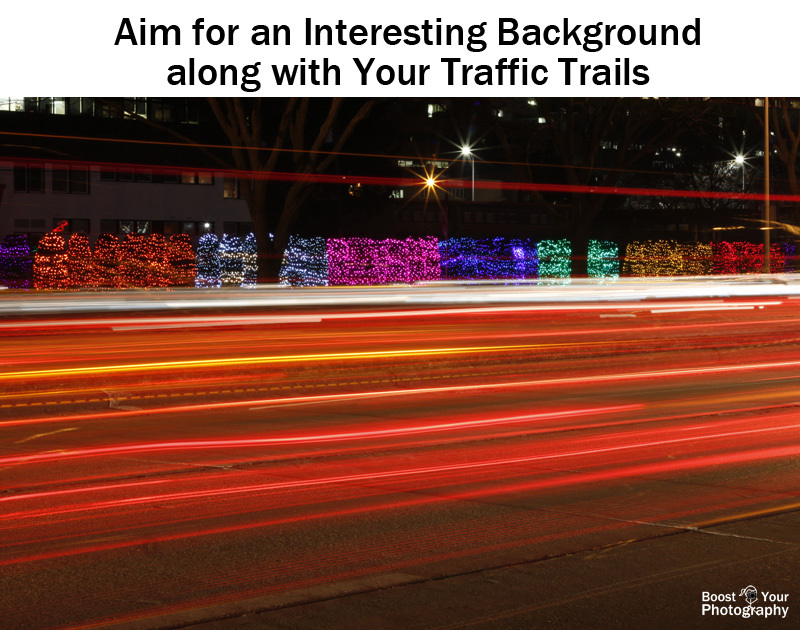 Focusing can be difficult when shooting traffic trails, as your subject (cars) is moving, and you are often shooting in low light conditions. Find something else in your photograph that is in the same focal plane as your subject. (In the photograph above, I used the light pole.) 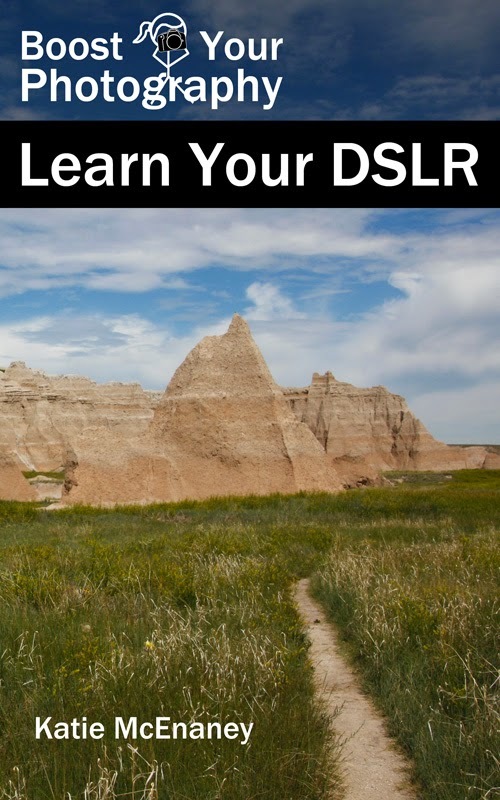 After your camera has focused on your substitute, switch your lens into manual focus. Now your focal distance is set, and you can start shooting. You need to think about the non-traffic portion of your image, as well as how you want the traffic trails to interact with the rest of the photograph. A higher vantage point (like the bridge used for the opening image) allows you to capture a longer expanse of trails. Natural higher vantage points (like the hill, below) can also add depth to your photograph, as the light trails recede into the distance. On the other hand, getting in closer to your subject can add detail to your scene. This shot below is taken of the same intersection as the shot above, but I positioned the tripod much nearer (just in front of the temporary construction sign visible above). The long shutter speed (15 seconds) in the photograph above allowed me to capture both the red and green light. The cars were still for the second half of the exposure, which made them somewhat visible in the final image. The oncoming cars and cars turning through the intersection, however, were in constant motion and therefore appear to have disappeared. 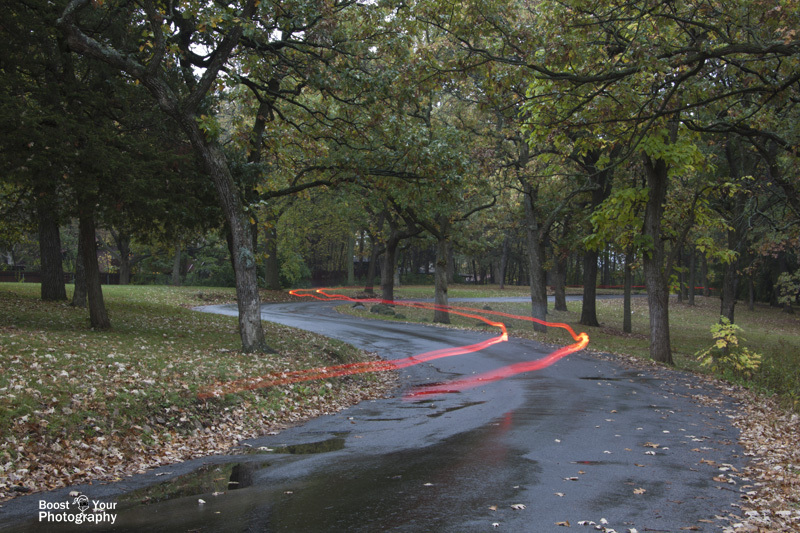 You can also use traffic trails to create more abstract images by omitting the road and its context. 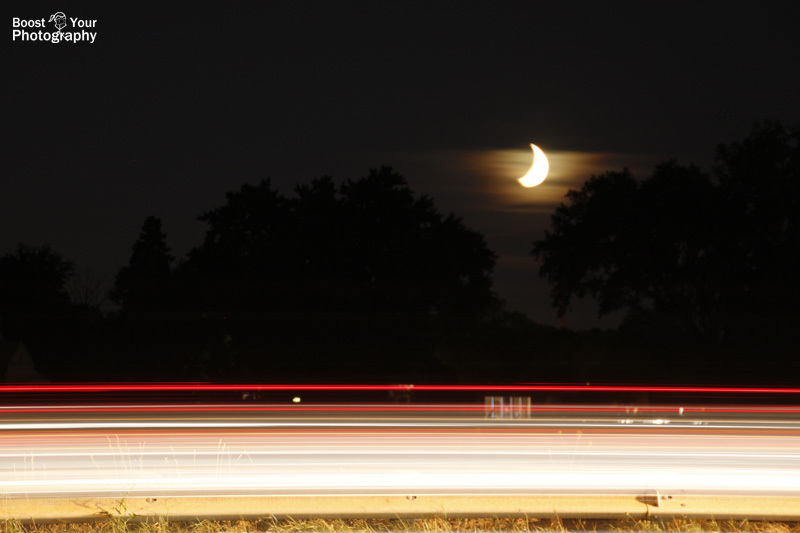 Here, the crescent moon (slightly blurred from the long exposure) is given an unusual setting with the passing lights of the highway traffic. 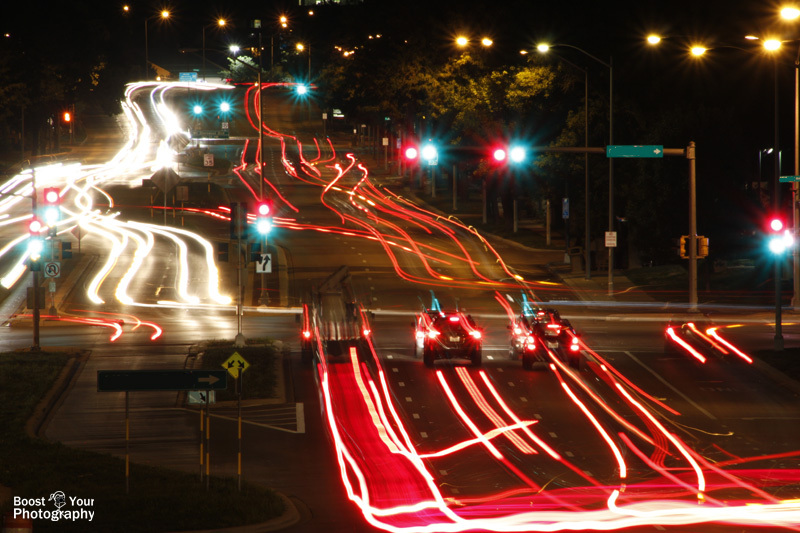 Getting down low and shooting up can really improve the size and appearance of traffic trails in your photographs. 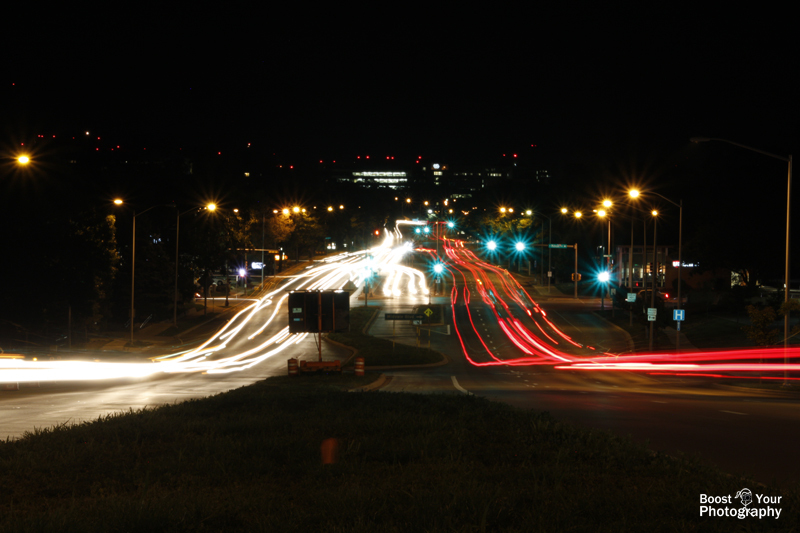 From down low, you can set an angle such that the traffic trails appear to tower over the whole of your composition. This works particularly well if you can set up at a location that has buses or trucks that have lights higher up than your average car. For the photograph above, I set my tripod on its lowest setting and aimed upward. This allowed me to capture light trails across the whole of the image. (The top trail is from a passing bus.) The row of lit trees adds another layer of the interest to the final photograph. Traffic trails are not just restricted to nighttime, either. 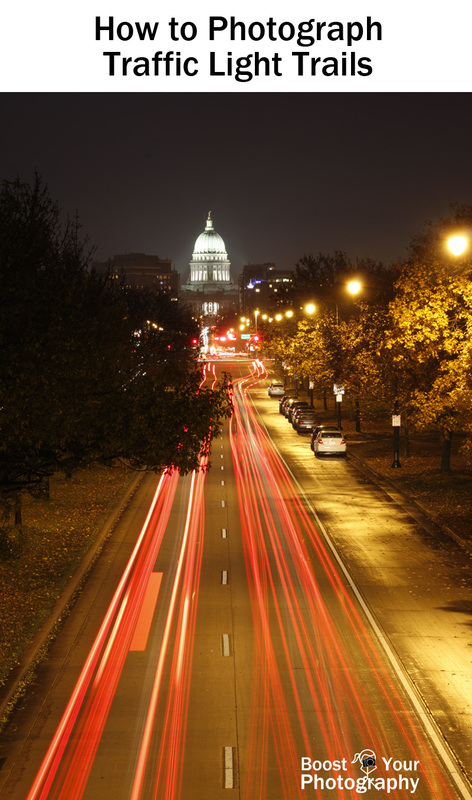 Dim or darker conditions can allow you to still use a long shutter speed. The photograph below was shot on a drizzly, foggy morning. The car was traveling fairly slowly on the curves, so I waited until it can just entered the frame. The brighter dips in the traffic trail are the results of the car hitting and bouncing over a pothole in the road. Traffic might be an annoyance when you are trying to get somewhere else, but it can be great for photography! Next time you are stuck in traffic, look around. You might find a great vantage point to come back to and capture some amazing shots!